At the recent Mitel BPC event, which took place in Hollywood Florida, I was able to make it down to the beach a few times. I grew up in California, so I find the Florida coast familiar but warmer. Anyway, I feel an obligation to jump in the sea when visiting a coastal resort (as do some other analysts), so I opted to sport my TalkingPointz Tee. TalkingPointz isn’t just about witty and fair insights into enterprise communications, it is also about safety. The sun’s UV rays can cause premature aging and skin cancer. 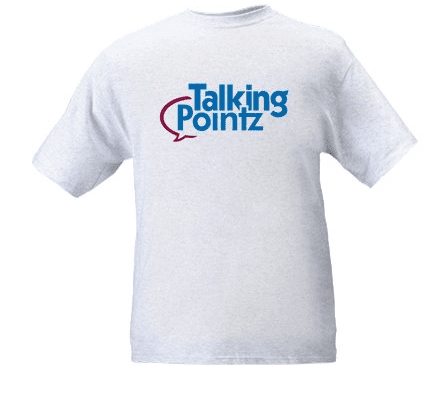 It’s unlikely that my TalkingPointz T-shirt offers any real protection, but at least I looked sharp. How sharp? I got two orders! No self respecting telecommunications professional should be without a TalkingPointz Tee. These shirts are now available for a flat rate of $10 including lower 48 shipping. The shirt, when accompanied by the optional Veg-O-Matic (sold separately) can slice and dice tomatoes, potatoes, and bass. To order your shirt just send me a note. It’s that easy. Operators are standing by and smoking. Disclaimer: This product is meant for marketing purposes only. Any resemblance to real persons, living or dead is purely coincidental. Void where prohibited. Some assembly required. List each check separately by bank number. Batteries not included. Contents may settle during shipment. Use only as directed. No other warranty expressed or implied. Do not use while operating a motor vehicle or heavy equipment. Postage will be paid by addressee. This is not an offer to sell securities. May be too intense for some viewers. Do not stamp. For recreational use only. Do not disturb. All models over 18 years of age. If condition persists, consult your physician. No user-serviceable parts inside. Freshest if eaten before date on carton. Subject to change without notice. Times approximate. Simulated picture. Please remain seated until the ride has come to a complete stop. Breaking seal constitutes acceptance of agreement. Many suitcases look alike. Contains a substantial amount of non-tobacco ingredients. Apply only to affected area. Article is provided “as is” without any warranties. At participating locations only. As seen on TV. All rights reserved. Allow four to six weeks for delivery. Avoid contact with eyes and skin and avoid inhaling fumes. Avoid extreme temperatures and store in a cool dry place. Be sure each item is properly endorsed. Call toll free before digging. Closed-captioned for the hearing impaired. Caution. Coffee is very hot. Do not attempt to drive and drink at the same time. Colors may, in time, fade. We have sent the forms which seem right for you. Slippery when wet. Not affiliated with the American Red Cross. No manatees, small fur-bearing animals or trees were harmed in the production of this page. Stiff penalties for early withdrawal. Keep cool; process promptly. Post office will not deliver without postage. Not responsible for direct, indirect, incidental or consequential damages resulting from any defect, error or failure to perform. At participating locations only. The material on this page may be offensive and frightening to small children. All models over 18 years of age. Do not place near a flammable or magnetic source. Do not puncture, incinerate, or store above 120 degrees Fahrenheit. Do not remove this disclaimer under penalty of law. I am not a professional, I have no training, I’m not even particularly good at handling my own relationships. Don’t believe everything that you read. Do not eat anything that has been on the floor for more than 10 seconds. Power tools are not an effective cure for headaches. If this were an actual emergency, this broadcast would be followed by official information and instructions. Keep your hands to yourself. Do not point. Please do not feed the animals. Not to be taken internally. Wait at least 1/2 hour after eating before using this. Lost ticket pays maximum rate. Your canceled check is your receipt. Sanitized for your protection. Be sure each item is properly endorsed. Employees and their families are not eligible. Beware of dog. Contestants have been briefed on some questions before the show. Limited time offer, call now to ensure prompt delivery. You must be present to win. No passes accepted for this engagement. Processed at location stamped in code at top of carton. Shading within a garment may occur. Use only in a well-ventilated area. Keep away from fire or flames. Replace with same type. Approved for veterans. Booths for two or more. Check here if tax deductible. Some equipment shown is optional. No Canadian coins. Not recommended for children. Reproduction strictly prohibited. No solicitors. No alcohol, dogs or horses. No anchovies unless otherwise specified. Driver does not carry cash. Some of the trademarks mentioned in this product appear for identification purposes only. Objects in mirror may be closer than they appear. Record additional transactions on back of previous stub. Unix is a registered trademark of AT&T. Please do not sue me.